A PhD at UCL ? 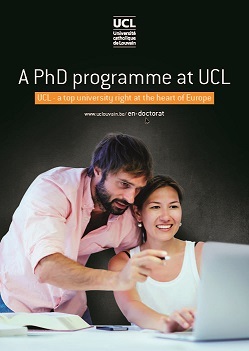 At UCL, a Doctoral Commission (CDD) supervises all the PhD programmes in the Health Science sector ("Medical Sciences, Public Health, Dentistry, Biomedical and Pharmaceutical Sciences, and Movement Sciences"). This committee delegates the tasks of local, daily management of doctoral students to "Disciplinary Committees" (CP). In principle, a master (120 credits) gives access to a PhD programme in the Heath Sciences sector. Specific conditions may, however, exist in the UCL Doctoral Regulations. Specific dispositions exist for PhD programmes in the Health Sciences sector : see here CDD-santé. If you are considering a PhD in the Health Sciences at UCL, the first step, before enrolling, is to identify a promoter and a research subject. For this, you can consult the websites of the different Research Institutes. The promoter will then assist you finding appropriate funding to support your PhD. You can also visit the "Researcher Mobility Funding" page on UCL website. A PhD training is a prospective full-time work, extending over 4 years in principle. For MD with a clinical practice, specific rules are applicable. This training programme is established in a flexible and specific way to meet the PhD student's needs according to his·er background. Each individual doctoral programme content is validated by the CDD. A mimimum of 60 training credits is required at the end of the PhD programme. The breakdown of these credits is given in the menu on the right.